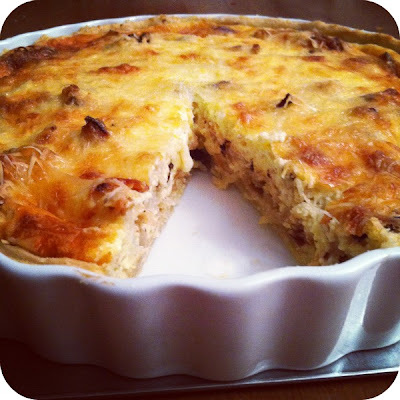 Last night I baked this savory tart for dinner and wow... It was absolutely delicious; rich, melt in your mouth, got to have a second-helping scrumptious. I found the recipe via Smitten Kitchen, my favorite go-to site for amazing tried and true recipes. You can visit Deb Perelman at Smitten Kitchen for any substitutions or for more detailed information about the recipe. She adapted hers from the pages of Bon Appetit. Do yourself a favor and make this tart asap! I promise you won't be disappointed. Preheat oven to 425º F (position rack in center of oven.) Toss cauliflower with 2 tbsp of olive oil in large bowl. Spread on rimmed baking sheet, sprinkle with salt and pepper and roast 15 minutes before turning florets over and roasting another 15 minutes until brown and tender. Cool cauliflower then thinly slice. Reduce oven to 350º F.
In the meantime, make the tart crust (recipe below). While the tart shell is chilling in the fridge, heat remaining 1 1/2 tbsp olive oil in a large heavy skillet over medium-low heat. Add onion, season with salt and peeper and cook until onion is a deep golden brown, stirring occasionally, about 30 minutes. Cool slightly. Whisk eggs, mascarpone, cream and pepper in a medium bowl. Stir in Gruyère. Pour mixture over filling in tart pan, sprinkle with Parmesan. Bake until tart is golden and center is set, about 40 minutes. Transfer to rack and cool 15 minutes before serving. In a large bowl, combine flour, cornstarch, and salt. Cut the butter in with a pastry blender, for or two knives until mixture resembles coarse meal. Add one egg and mix with a fork until dough forms. If the dough doesn't come easily together, dump mixture onto counter and knead together. On a lightly floured surface (or between two sheets of plastic wrap), roll out the dough to a 12-inch circle. Place dough in 9-inch tart pan and press to remove any air bubbles. Cut excess dough from rim, and refrigerate for 30 minutes. No parbaking required. Okay, so I was a busy baker because I also made dessert. 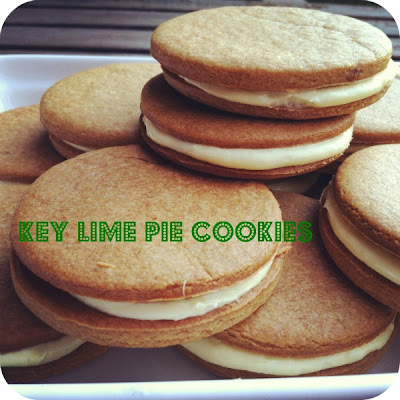 I don't normally bake cookies but these are Key Lime Pie cookies (via let'sgetcooking.) Key Lime Pie is my favorite dessert as I love most things sweet and tart. Plus, I was intrigued with the idea of a pie in a cookie. To prepare cookies, combine the flour, brown sugar, baking soda, and salt in the bowl and mix well (can pulse in a food processor.) Cut in the butter until mixture resembles coarse meal. In a small bowl, whisk together honey and milk. Add to flour mixture and mix (or pulse in food processor) until the dough comes together. If you used the food processor, the dough will be soft and sticky. Separate the dough in two. Dust a piece of waxed paper with flour and lay half of the dough on top. Pat dough into a disk, sprinkle flour on top and top with another piece of wax paper. Roll out to 1/8-1/4 inch thick. Freeze or refrigerate until firm. Repeat with other half of dough. When chilled, cut dough into rounds with cookie cutter. Place on parchment paper lined baking sheets and bake at 350º F for 8 to 10 minutes, or until lightly golden. Remove from baking sheet to cooling rack and let cool completely. To make filling, combine sugar and cornstarch in a small saucepan. Stir in lime juice and water until smooth. Bring to boil; cook and stir for 1 minute or until thickened. Remove from heat. Stir a small amount of the hot mixture into the beaten egg yolks slowly, until eggs are lukewarm. Stir eggs into the remaining lime mixture. Bring to a gentle simmer; cook and stir 1 minute longer. Remove from heat and stir in salt. Cover with plastic wrap and chill in fridge. When lime curd is cooled, beat cream cheese with an electric mixer until smooth. Add lime curd, mix well. Add powdered sugar, starting with half a cup at a time, until mixture reaches a buttercream frosting consistency - thick enough to pipe and hold it's shape. When cookies are cool, assemble by piping or spreading a dollop of filling onto the center of one cookie; top with second cookie and press lightly. Repeat with remaining cookies. May I ask what's the difference between a tart shell & a pie crust? Are they essentially the same?